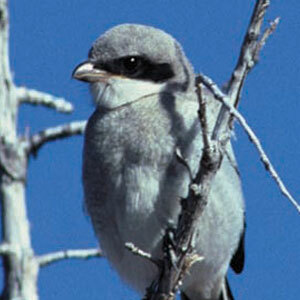 Distribution: The loggerhead shrike is found in suitable habitat throughout central and southern North America. Shrikes are considered relatively abundant in the Central Valley, although their numbers have been declining. In the Natomas Basin, loggerhead shrikes can be regularly observed, although they occur in low densities throughout the basin. Habitat Requirements: Loggerhead shrikes prefer open woodland, grasslands, and edge habitats containing elevated perches from which to hunt. Rural residential areas and pastureland provide ideal foraging perches in the form of telephone lines and barbed wire fences. The landscape also typically contains dense shrubs, low trees, or debris piles for nesting. Reproduction and Demography: Loggerhead shrikes often remain paired throughout the winter and nest early in the spring. They build cup nests of sticks, forbs, and grass and often line them with wool, fur, fine plant material, or scraps of string and fabric. Nests are constructed in dense growth where available, with thorny trees and shrubs preferred. If no trees or shrubs are present, shrikes will use brush piles, vines, or accumulations of woody debris upon which to build their nests. Ornamental shrubs and dense growth low in eucalyptus trees may also be used for nesting. The female lays five eggs, on average, and incubates them for approximately 16 days. Young are helpless upon hatching and spend almost three weeks in the nest before fledging. Movement: Central and southern California loggerhead shrikes are generally year-round residents. Juvenile shrikes tend to disperse quite widely, while adults usually return to nest in the same general area year after year. Ecological Relationships: Loggerhead shrikes prey on both invertebrates and vertebrates, including insects, small reptiles, amphibians, birds, and mammals. Like others in their family, loggerhead shrikes often impale their prey on spiky vegetation, thorns, and even barbed wire fences to help with manipulating their food while they eat and to store food for later consumption.